Jaguar Land Rover and the Retailer Network are committed to providing equal opportunities in employment, taking all reasonable steps to encourage and identify the best talent and to creating an inclusive working environment where all staff are assisted and encouraged to reach their full potential. What inspired you to pursue an apprenticeship? I’ve always been a hands on person, always on the go, so sitting in a classroom on a typical college course didn’t appeal to me. An apprenticeship combines hands on working and relevant learning. I really enjoy the working environment. Earning money and learning seemed like the way forward! How did you apply and what was involved? I was eager to find an apprenticeship role in the motor industry and spent lots of time online looking for the right one. Once I’d applied I attended an interview with the retailer and completed a variety of assessments. My parents supported me through my application as this was really important to ensuring that I gave myself the best chance of getting the apprenticeship. They’ve always encouraged me to achieve but at the same time making sure that I do something that I enjoy rather than worrying what others think I should be doing. How’s your apprenticeship programme going so far? It’s going really well. I have learnt so much in the past 2 years. The Jaguar Land Rover Academy has been really supportive, as have my employers. They have helped me learn at my own pace. I’ve gained loads of confidence within the working environment and I enjoy going to work each day. What are your plans once you have completed your apprenticeship? I’d love to stay with the brand and to continue to gain more experience. I know there are lots more learning opportunities available beyond my apprenticeship. I want to keep furthering myself and the aim is to become a master technician! What message would you give to someone thinking of pursuing an apprenticeship? I would highly recommend an apprenticeship. I’ve gained so much from being able to get hands on in the workplace and it’s great to be earning and working toward a qualification at the same time. I never wanted to go to University. I've been brought up watching my dad fix cars which sparked a keen interest in mechanics and I wanted to learn how to fix things. The Jaguar Land Rover Apprenticeship Programme is a great opportunity. Since joining I've felt extremely welcome on to the programme and a part of the team at Guy Salmon Stratford. I've enjoyed very much coming to the Academy and have made great friends. My aim is to become a qualified Service Technician and eventually I want to complete a Level 4. I'd really like to encourage other girls to choose to do an apprenticeship in Light Vehicle Maintenance and Repair. It's been a great decision for me. You get a really hands on experience and you can see a clear career path. It is also great doing something you really enjoy every day. The opportunity was massive for me. I'm part of a team and am doing something that I enjoy. I like to be different and stand out from the crowd! My family have been very supportive about my career choice. 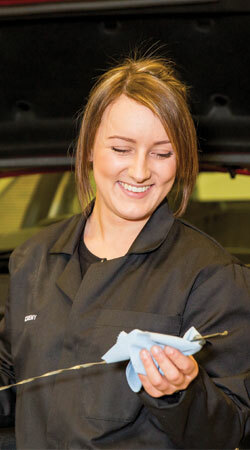 I had been looking to pursue a career in Light Vehicle Maintenance and Repair since completing a year at college and found the opportunity on the Careers Wales website and thought this would be a great way to get some hands on experience. When I started I was made to feel extremely welcome in the workshop and on training at The Jaguar Land Rover Academy. I feel like a valued member of the team. My aim now is to progress as far as I can and to become a Master Technician. If this is a career that a girl wants to do they should go for it. Never feel limited in terms of the roles that you can apply for as you may be the best person for the job. The opportunity has given me lots of vital work experience and I have been able to work on great, brand new vehicles.